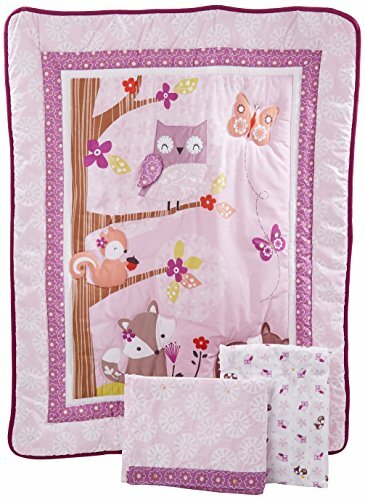 This whimsical fairy tale set features our darling owl Tootsie and includes a quilt, fitted sheet and dust ruffle. Our "perfect fit" bumper is sold separately. Quilt measures 35" x 44". The sheet is 55% cotton, 45% polyester and fits a standard size 52"x28" crib mattress. The dust ruffle has a 10" drop with a 100% olefin platform. Care instructions: machine wash cold with like colors. Gentle cycle. Do not bleach. Tumble dry low. Iron on lowest setting as needed. 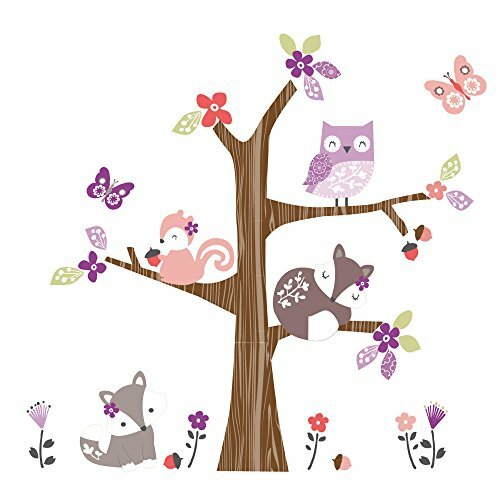 Complete your nursery with our easy-on, easy-off wall appliques of our forest friends relaxing on their favorite tree. Includes 3 sheets of various stickers that won't harm your walls and are reusable. 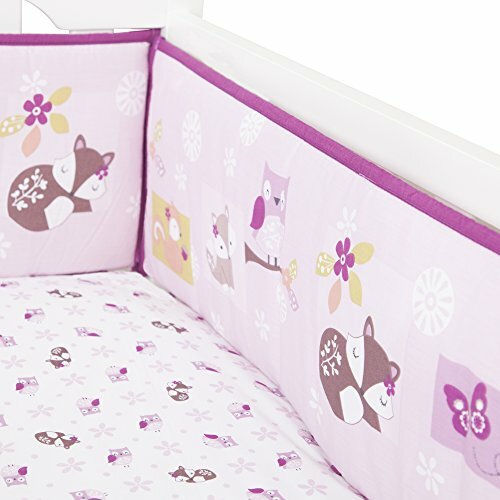 Tossed little owls and sweet baby foxes along with pink flowers and dots decorate our fitted crib sheet. The second sheet is a solid lavender. Each sheet fits a 28" x 52" crib mattress and is a cotton blend of cotton/polyester. Elastic edging ensures a snug fit. Lavender Poppy Mix-and-Match Crib Bedding CollectionThe decorating options that this collection gives you are impressive. But even more astounding are the high quality features offered by this Lavender Poppy 4-In-1 crib bedding set: - Every fabric used in this collection is 100% natural cotton; even the coverlet filling is cotton; it is rare to find 100% cotton fabrics used in crib bedding collections at this price point - At 44 by 38 inches, the Lavender Poppy quilted coverlet included in this set is larger than most quilts that you are likely to get with other collections; the detailed quilting will make this coverlet last for years. - Many so-called reversible quilts or comforters offer you a far less decorative option on the reverse side; for the Lavender Poppy coverlet, it is impossible to judge which side is the primary side since each stands on its own from a design standpoint. 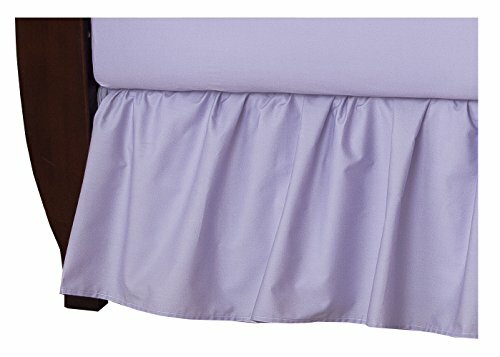 Our "perfect fit" 4-Piece Crib Bumper has two long sides that measure 9 1/2" high x 50 1/2" long and have a total of 16 sets of satin ties to securely hold the bumpers in place. The two short sides measure 9 1/2" high x 26 1/2" long and has a total of 8 sets of ties. The bumper is made of 65% cotton, 35% polyester with 100% polyester fiber filling. Fabric content is exclusive of decoration. Care instructions: machine wash cold with like colors. Gentle cycle. Do not bleach. Tumble dry low. Iron on lowest setting as needed. 10 Piece Set Includes:(1)Crib Quilt ,(1)Crib Bumper (1)Fitted Sheet,(1)Crib Skirt (Dust Ruffle),(1)Diaper Stacker,(2)of Window Valances ,(1)Toy Bag ,(1)Baby Pillow and a baby Mitten one pair. Plus:Diaper Bag with Accessories. This set fits all Baby cribs and Toddler Bed! 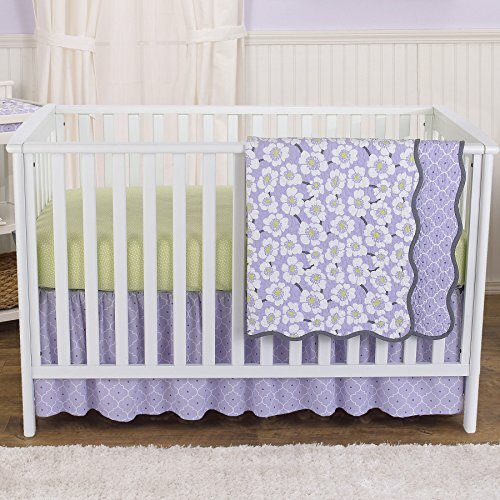 Compare prices on Crib Bedding Lavender at ShoppinGent.com – use promo codes and coupons for best offers and deals. Start smart buying with ShoppinGent.com right now and choose your golden price on every purchase.